In the framework of the Code For All Global Summit, we paid tribute to all the victims of natural disasters. Omayra Sánchez was a 13-year-old girl who died after the eruption of the Nevado del Ruiz volcano in 1985 in the city of Armero, Colombia. She survived for three days. It was reduced to more than 25,000 dead and missing in this city of the department of Tolima. On November 13, an avalanche product of the Nevado del Ruiz volcano desert submerged the population in a chaos of mud, lava and debris. The avalanche is ten meters high and it is dragged in a matter of hours to the white capital of Colombia, named for its cotton crops. This year (2018), in the framework of the Code For All Global Summit an event that takes place this year in Bucharest, is a meeting in which people and organizations from different actors discuss the barriers, the challenges and the future of civic technology As a form of revolution and influence global social change. On this occasion, we wanted to pay homage to all mortal victims of natural disasters, effects of these phenomena upset daily lives. 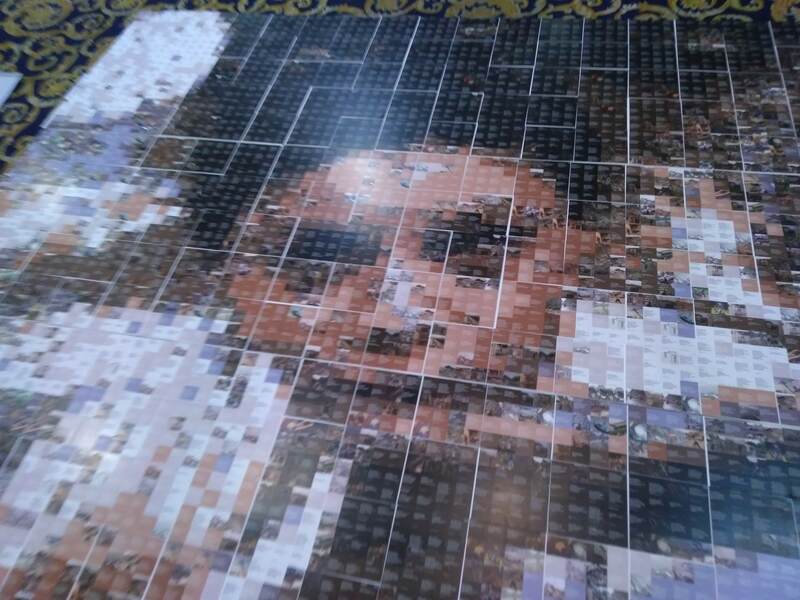 For this, we built a mosaic with the face of Omayra Sánchez from news headlines of accidents and tragedies around the world, figures and data on the number of deaths, loss of materials and harrowing phrases that reconstruct the history of tragedies. In this order of ideas, this mosaic is also presented as a critique of human activity, is triggered, precipitated and precipitate the sudden and violent in the environment, as the intervention of nature indiscriminately, extractivist activity, aggressive deforestation the construction of infrastructure in risk areas are some of the examples and the lack of planning, security measures, emergency plans and warning systems year after year causes adverse and devastating effects on the planet. However, how powerful this exercise is is the ability to transfer the data, figures and information that normally lie in the digital space in a tangible and recognizable place by spectators and publics. This year marked the 33rd anniversary of the tragedy of Armero and we are very pleased to be able to carry out this type of exercises in international spaces, where we all identify with tragedy, pain and the loss of human beings when we face the ravages of nature. The road is long, but this type of media, time, open source and civic action that can impact, make visible and recognize movements, causes and struggles and in this way. Between citizens, public and private entities and we become more open and more informed regions, preventing disasters and making better decisions. If you want to replicate these initiatives, you can check the repository on github. You can use mosaic stories as tickets for your events. Each individual image or group of images must be the same size to form a perfect grid that is drawn on the wall. The tickets are labeled on the back with the corresponding rows (letters) and the column (number) in the grid. Participants will place their "entry ticket" in the corresponding box on the wall. Watch how your audience reacts when lines and bar graphs appear live to reveal a known image.